I again only exercised three times this week. I’m getting more and more busy as I get closer and closer to my leave date for the AT. I’ve always been a procrastinator, so I’m not surprised. We are getting down to crunch time! Therefore, next week I’ll do week four over again so my body can catch up to the intensity of the workouts in weeks five and six. The workout can be found here: http://www.fitclimb.com/page/6-week-beginner-mountaineering-plan-week-4. Monday: I returned to Mt. Waldo in Frankfort and hiked it in reverse. It was another beautiful day! 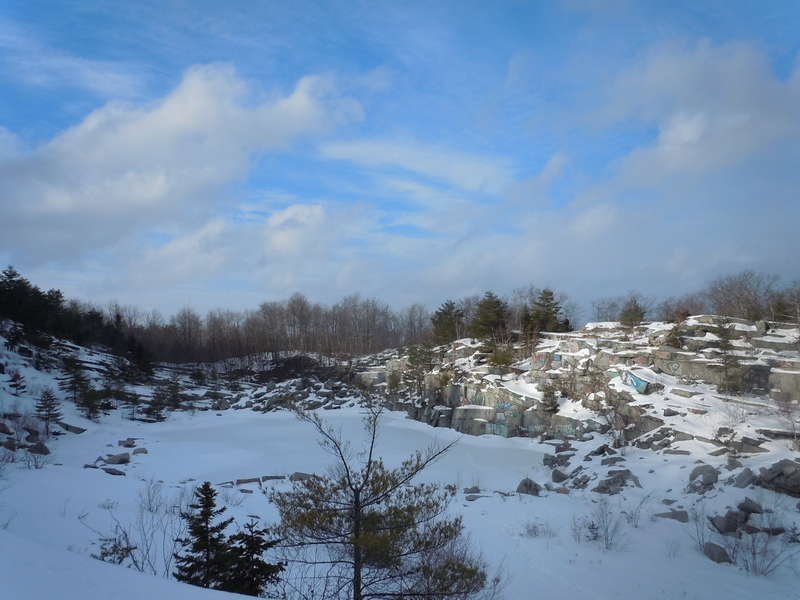 Kirsten and I decided to go down into the quarry and slide around on the ice. It made me feel like a kid again, a feeling I am constantly chasing. As adults, we often forget the joys of childhood. We can have them in our adult like too; we just need to recognize the opportunities! The hike took us about two hours round trip because we didn’t worry about what the watch said and just enjoyed ourselves. Kirsten and I above the quarry on Mt. Waldo. Sun behind us at the first viewpoint. Wednesday: Today I went for another hike up Chick Hill using the trail that goes up Little Chick Hill. Krystian and I also decided to hike down the snowmobile trail. 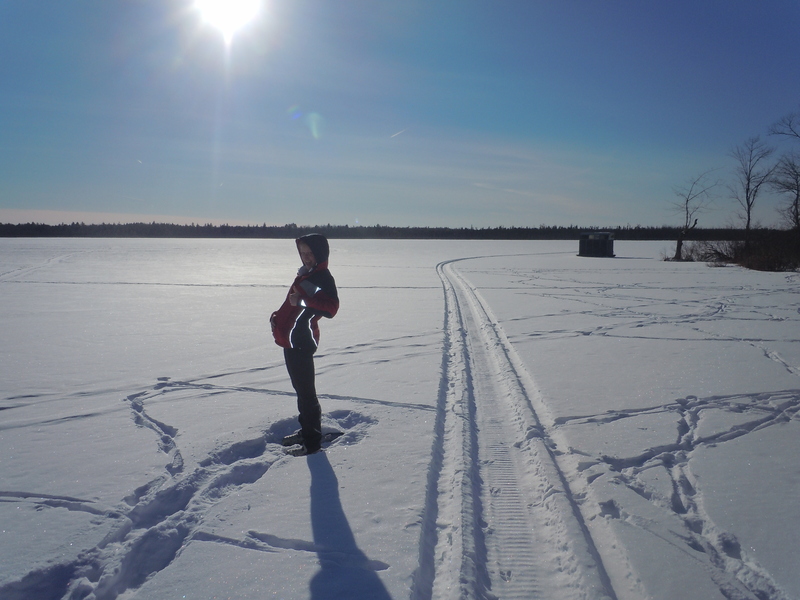 This turned out to be a good decision as one of Krystian’s snowshoes broke on the way down! This hike took about two hours round trip. I was definitely feeling tired and pack-muling it didn’t help. I had a hard time keeping up with Krystian, but I still had a blast. 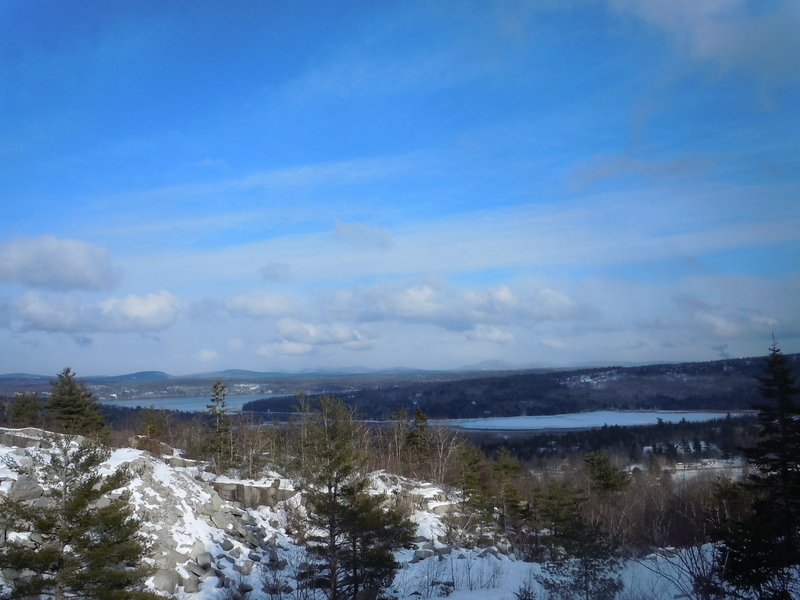 Nothing like a little fresh air and views of Acadia to put life into perspective! 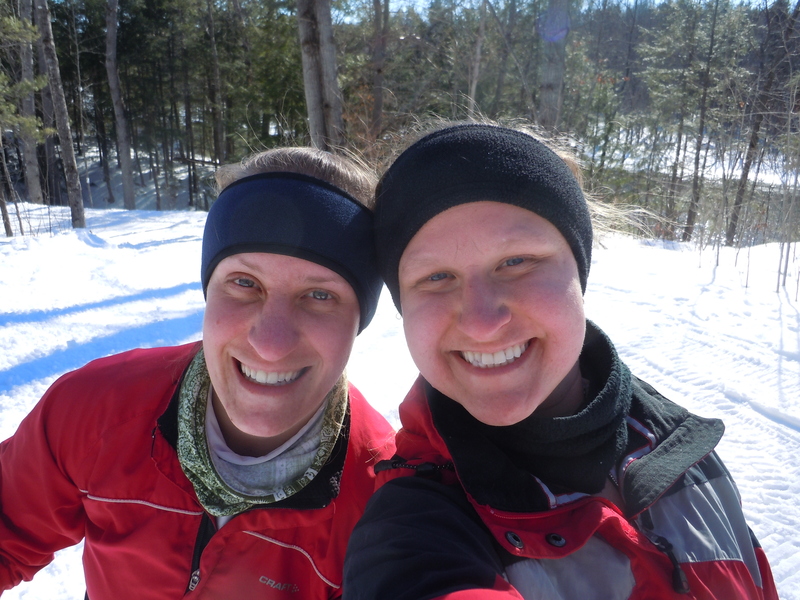 Sunday: Laura, my hiking partner and sister, and I decided to go skate skiing. 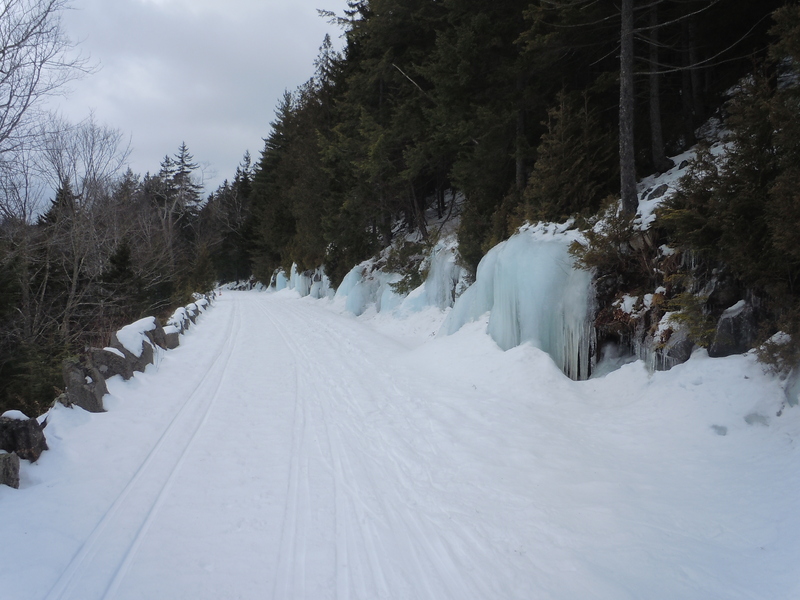 Bond Brook Recreational Trails posted that they had recently groomed the ski trails, so we decided to give it a try. The trails had been groomed, but all that did was break up the ice. 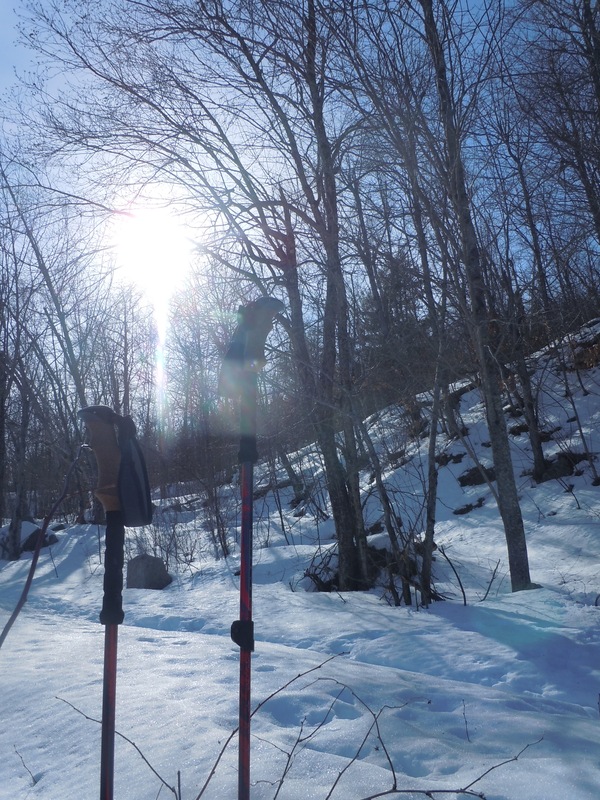 There were still chunks all over the trail making it hard for the edges of the skis to grip as the skis glided. I went down a couple of times because my skis were sliding all over the place! This actually made me work harder. I would fall near the bottom of hills, when my speed was high, and I’d have to get up and climb the next hill with no forward momentum. Still, I had no complaints on that gorgeous day. As we skied, there was a halo of yellow light around my shadow! Now that’s what I call a sunny day. 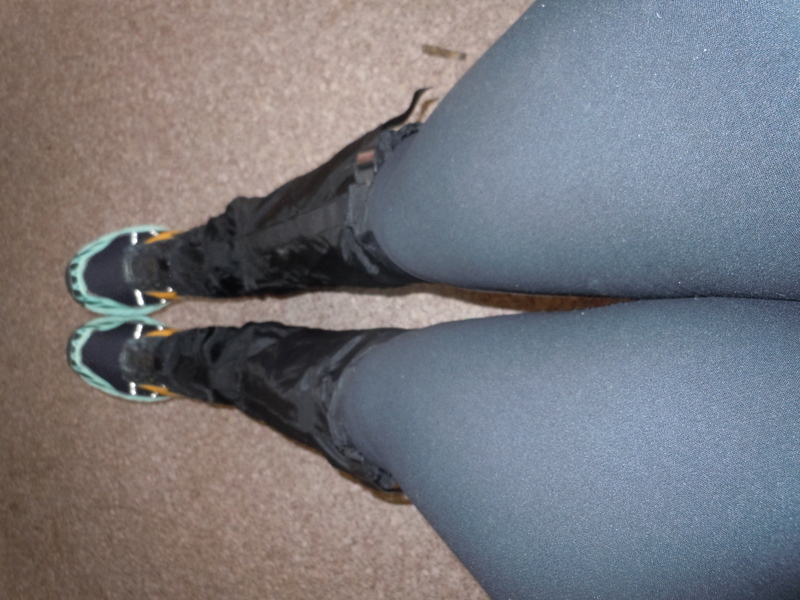 We skied for about 50 minutes and my knees were only a little achy after the workout! I can tell that my muscles are stronger than the last time I skate skied. I guess this training stuff must be working! The moon was up during our ski. Open field at Bond Brook in Waterville. As I said earlier in my post, I will be redoing Week Four of this six week training plan. Now he’s a video of Kirsten and I acting like children! I only got in three days of training this week. Yikes. As I got to the end of this week, I felt fatigued and a little sick, so I decided to take a few extra rest days. This really reminded me how important a healthy body is to keeping my training momentum going. This means eating right and taking proper rest time, including sleep at night as well as taking rest days from exercising. Now, as a recent college graduate living below the poverty line, it can sometimes be hard to eat right. We all know that healthy foods are more expensive and the food pantry down the road mostly hands out bread and potatoes. That being said, it can be done (frozen vegetables to the rescue!) with meal planning and eating leftovers. (This can be challenging as well when your roommate decides that your leftovers are now HIS leftovers!) This is what I will attempt to do over the next three weeks. Eat healthy. I could also get more sleep at night. Usually, I wake up early in the morning, despite my late bedtime, and get up for the day. I end up needing to take a nap late afternoon/early evening and this leads me to staying up late! Alas, the whole cycle starts over again. I will try to avoid taking naps so that I can get back onto a regular sleep cycle. This will hopefully help me feel stronger and more alert during workouts and I can avoid getting sick. Monday: My friend Amy and I decided today would be a good day for a hike, so we headed for Chick Hill in Clifton. As we got to the parking lot, there was another hiker who was packing up to leave. I asked about trail conditions, because we were trying to decide whether to take snowshoes or not. I am so glad I decided to ask! 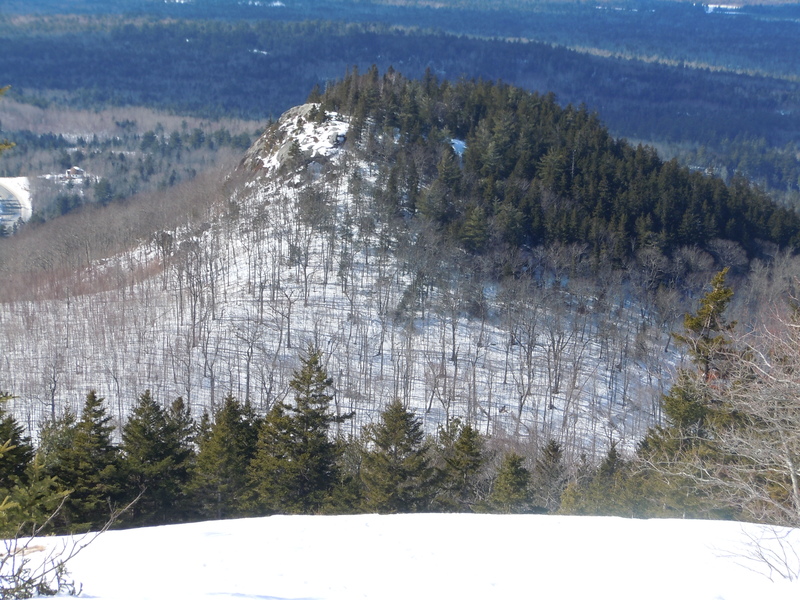 This kind, fellow hiker pointed us towards a trail that I didn’t even know about and suggested skiing back down. We didn’t have skis with us, but we plan on returning to try it out. However, we decided to try out the trail instead of walking up the road/snowmobile trail. This is a fun little hike that brings you to Little Chick Hill, then back into the valley and up to Chick Hill. The hiker at the trailhead informed us that between the trail (up) and the road (down), we were completing a three mile loop. Our hike took an hour and a half up, using the trail, and a half hour down, using the road. What a beautiful day and wonderful hike! View from Little Chick Hill. Amy and I, all smiles! View of Chick Hill from Little Chick Hill. Looking back at Little Chick Hill from the top of Chick Hill. Wednesday: Today, I decided to train at the gym. The training plan calls for 75 minutes of stairs, but there was no stair trainer there. Instead, I biked for 40 minutes and ran for 35 minutes with hill intervals. This was still a challenging workout! 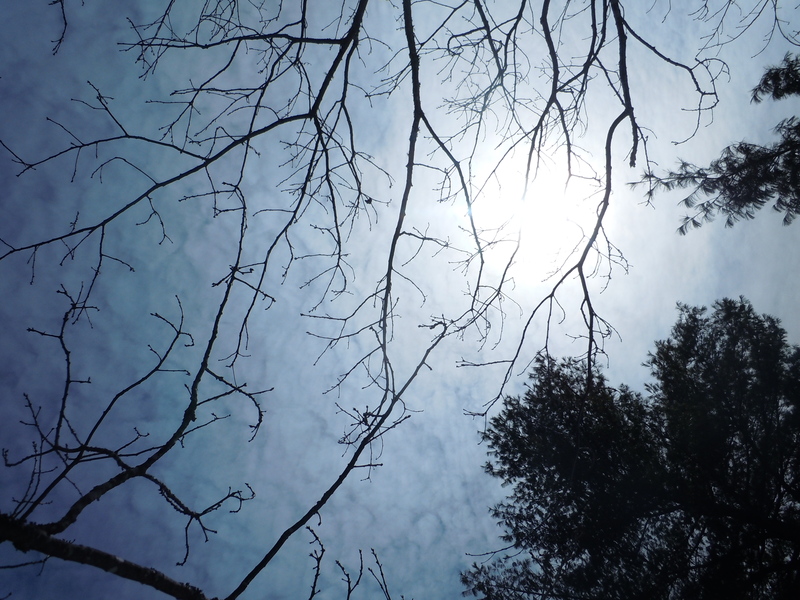 Thursday: Today was another sunny and beautiful day, so I decided to go for another hike. I found Waldo Mt. on a trail website and decided to check it out. 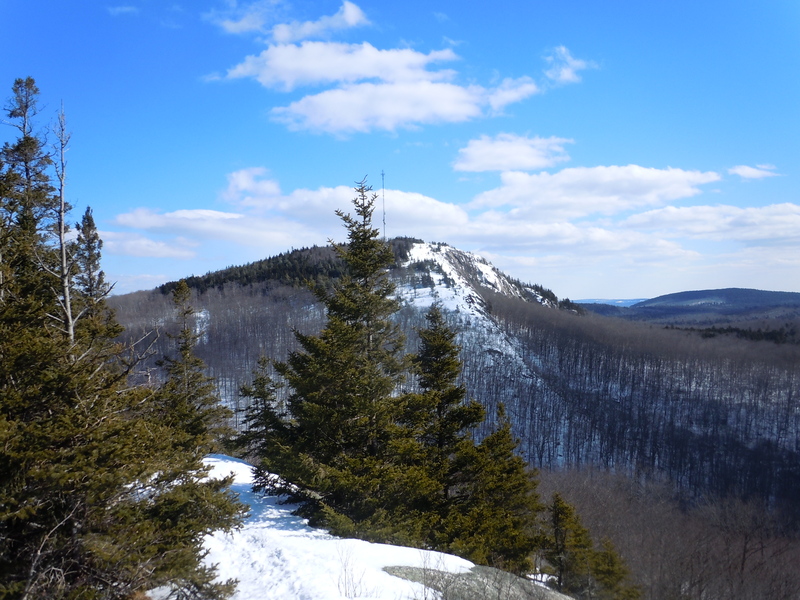 The mountain is located in Frankfort, which is right by where the Penobscot River enters the ocean. 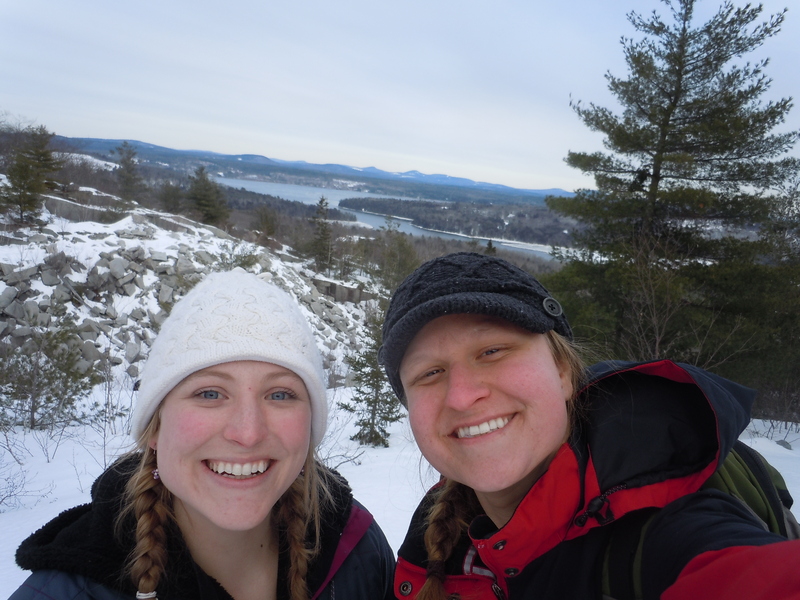 With snowshoes, it took Sage and I and hour to climb up and half an hour to climb down. It was fun to discover this mountain and I will use it in the future for more training. After I returned home, I completed four sets of strength and I also incorporated some balance exercises. Sage and I with some light snow coming down! Turns out Mt. Waldo is some sort of quarry? Stay tuned for next week’s training! Bar Harbor/Acadia National Park from the top of Chick Hill in Clifton, ME. As I prepare for my trek along the AT, I find myself drawn to different blogs giving tips by actual hikers who’ve completed the trail. I found some very unique and intriguing ideas, so I decided to try them out at home. My favorite tip is found on the appalachiantrials.com site in the article “10 Tips on How to Stay Warm Winter Backpacking”. 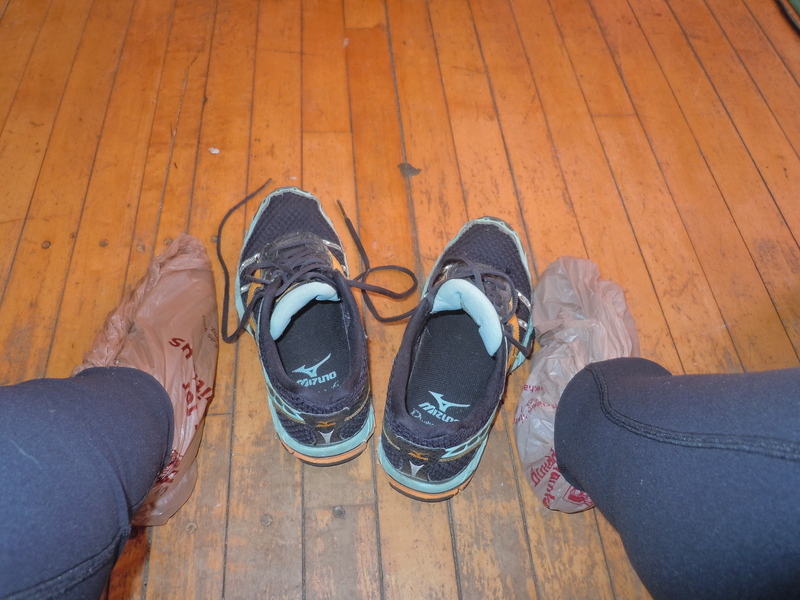 (View article here: http://www.appalachiantrials.com/10-tips-on-how-to-stay-warm-while-winter-backpacking/) The tip is to put a plastic grocery bag from a resupply over your sock before stepping into your shoe. This keeps your socks and feet dry, as your trail runners will get wet while tromping through the snow. I have tried this method out several times and I am very satisfied with the results. The plastic bag works as a vapor barrier, therefore water from the snow stays out. Likewise, this makes it harder for sweat from your feet to evaporate. 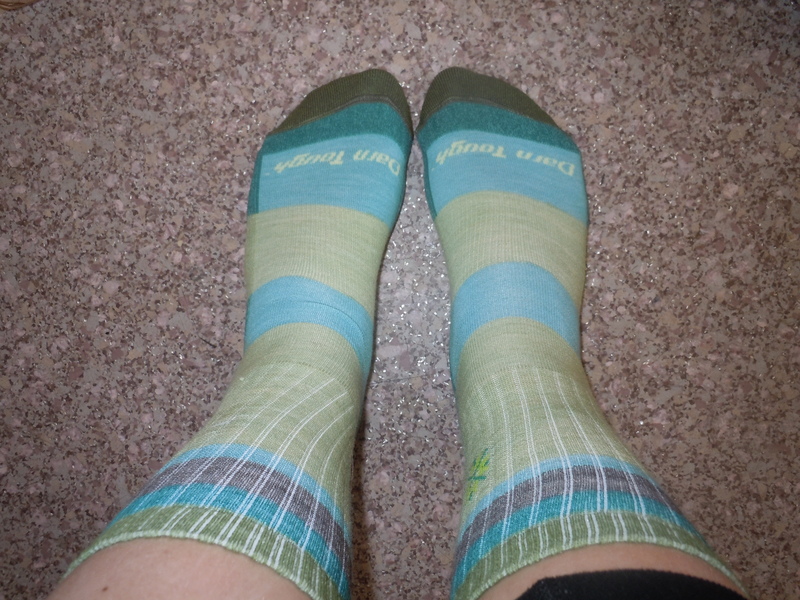 Therefore, your socks will still get moist, but your feet will stay warm as you adventure. I have tried this method in two different ways. The first was as the website suggests. Throw on a pair of socks with a bag on top and slip your feet into your shoes. 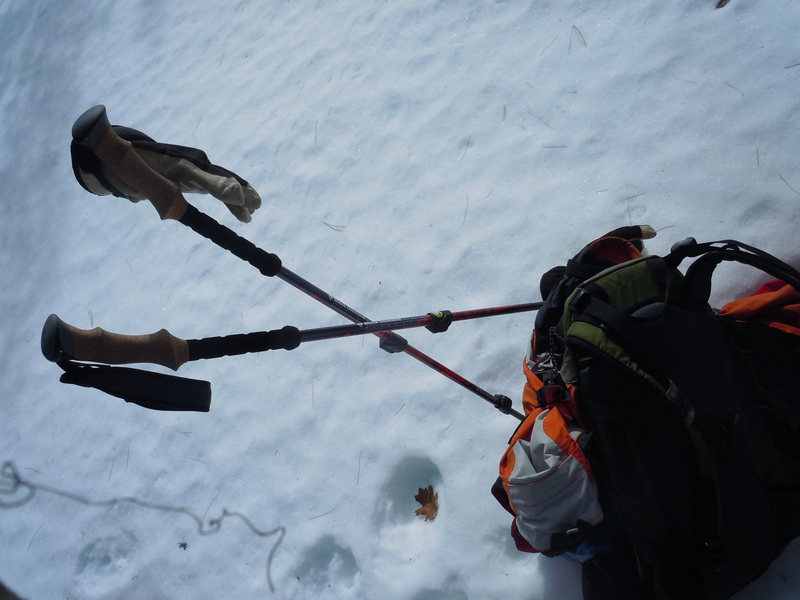 With this method, my feet were comfortable for the entire time I was snowshoeing. However, my feet must have been moving around, because when I removed my shoe, there was a small hole in the bag where snow-water had leaked through. Still pretty effective at keeping the water out, but I thought I could do better. Plastic bags over my socks! So, I tried placing an extra pair of socks OVER the bag in order to keep it from shifting. This also provides and extra layer of warmth and protection. 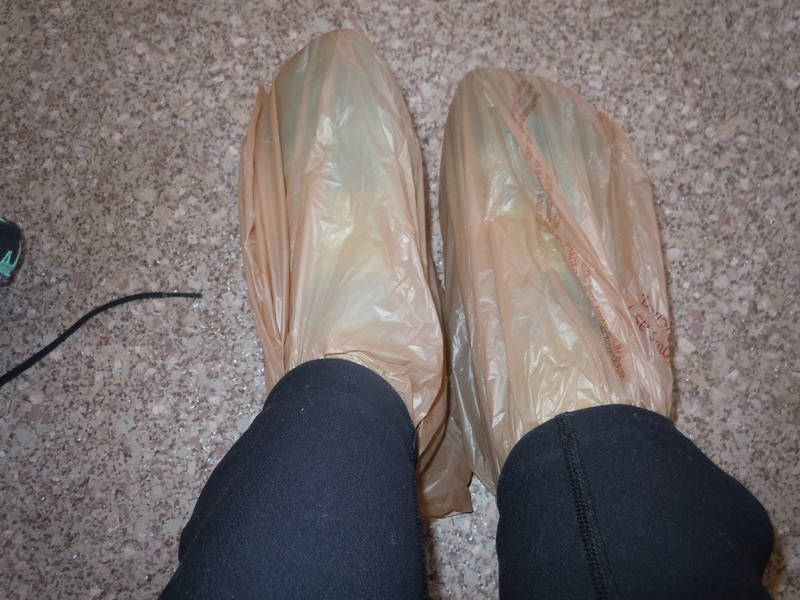 This method was successful at keeping the snow-water out, but I still had damp socks because I sweat from my feet. This also means that the outer sock gets pretty wet and will need to be dried out before reuse. However, I find this method successful, because my feet were warm and comfortable for the entire hike! With gators on, you can’t even tell the bags are there! Since I got similar results with both methods, I’d say it a matter of preference. 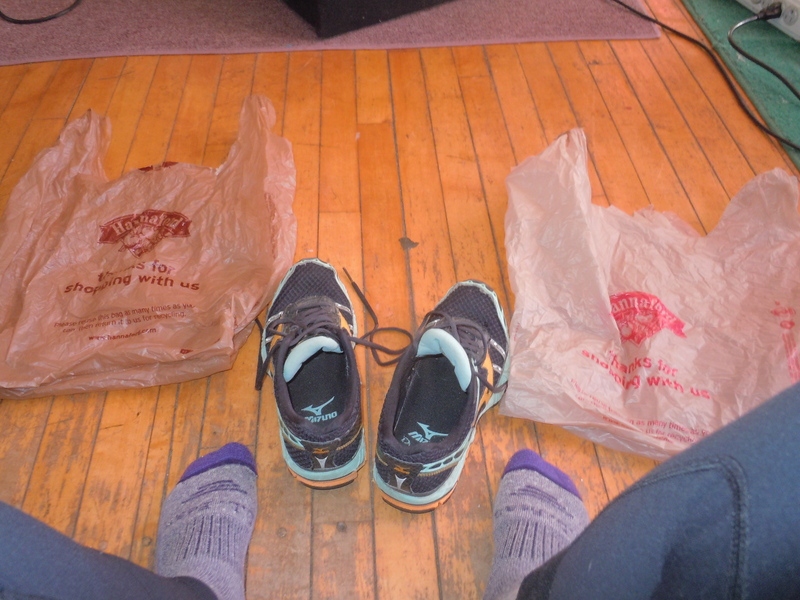 With the first method, your feet may shift allowing water to leak through the bag creating wet spots on your socks. 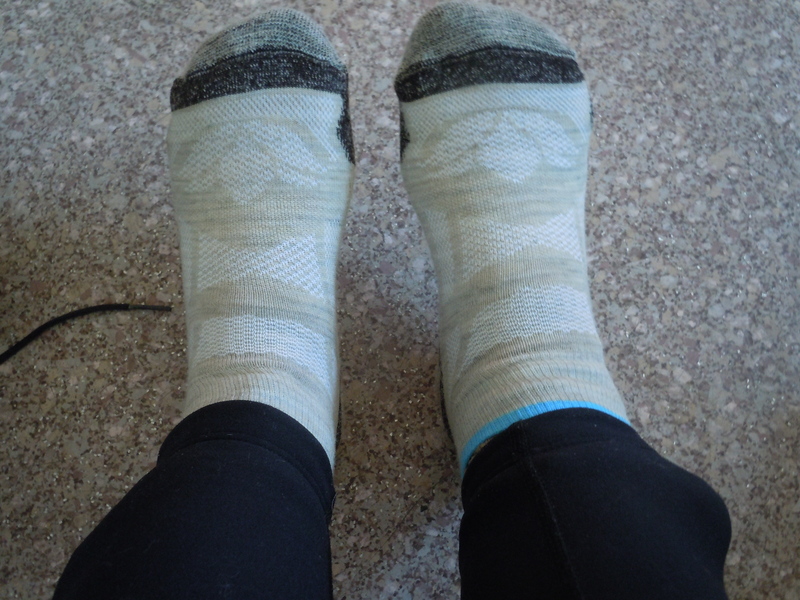 With the second method, you are sacrificing an extra pair of socks to keep your feet only damp instead of wet. Both methods resulted in warm and comfortable feet. I will continue to try out both methods as I train for the Appalachian Trail. I’ll let you know if I come to a conclusion on which method is superior! Note: The bags do make noise when you walk but the sound of trudging through the snow covers it! 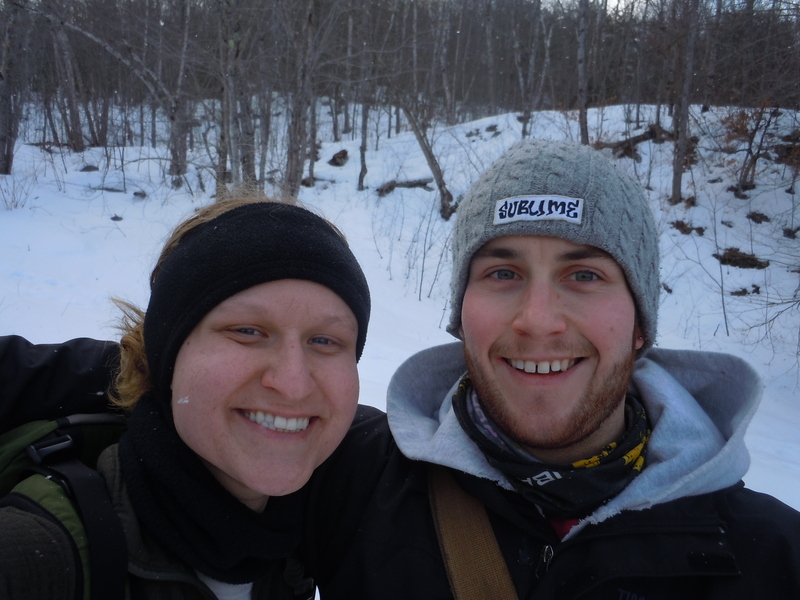 Amy and I during our ski adventure to the UMaine Ski Trails. I realized this week that I am very much a social adventurer. I don’t necessarily mean lots of people; one will do and is sometimes preferred! I just like to share my experience with someone else. Like last week, when my friend and I saw, no experienced, the flight of a HUGE bald eagle! 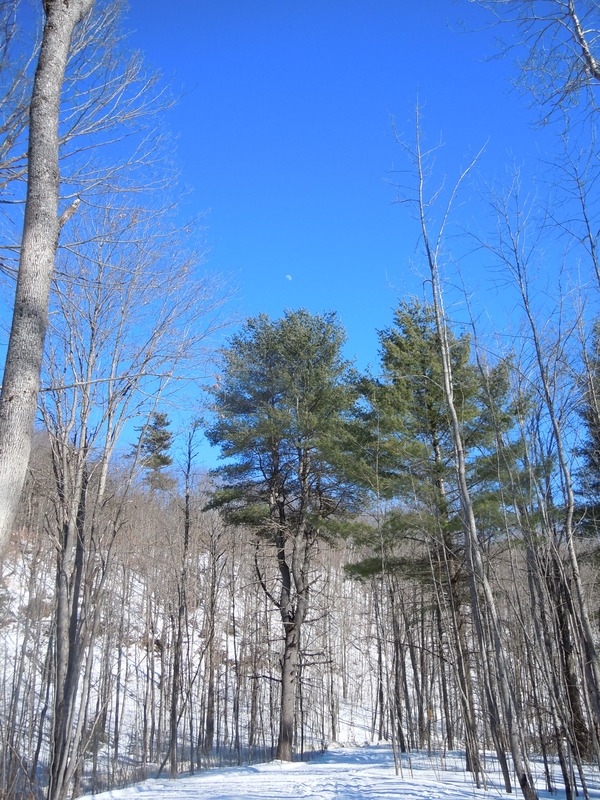 As we walked off the ice and back to the woods, the eagle leapt from it’s perch and flew in a large circle over our heads. Now, knowing that the Bald Eagle, on average, has a wingspan of six to eight feet with talons and a beak that would put up a good fight against my eyes made the experience all that more awe inspiring. Having the bird fly that close overhead had us saying things like “WOW” and “OH MY GOSH”. I realized being with a companion made that experience much more memorable. I do enjoy solo trips, but looking back, my best memories occurred when I was with another adventurer. Therefore, as I move forward with my training, I will try to enlist friends to experience the outdoors with me. 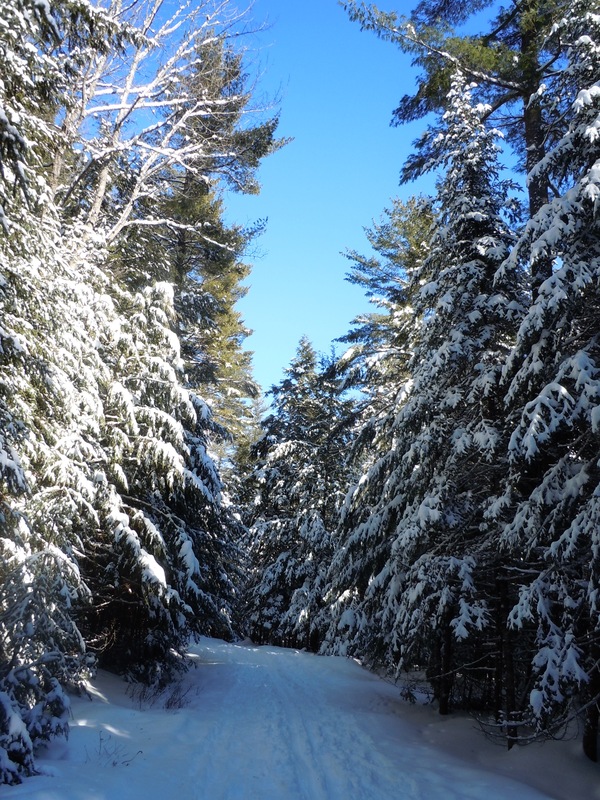 Monday: With fresh snow overnight, the University of Maine’s ski trails were begging to be explored! My friend and I set out for a late morning classical ski and ended up skiing for two hours. 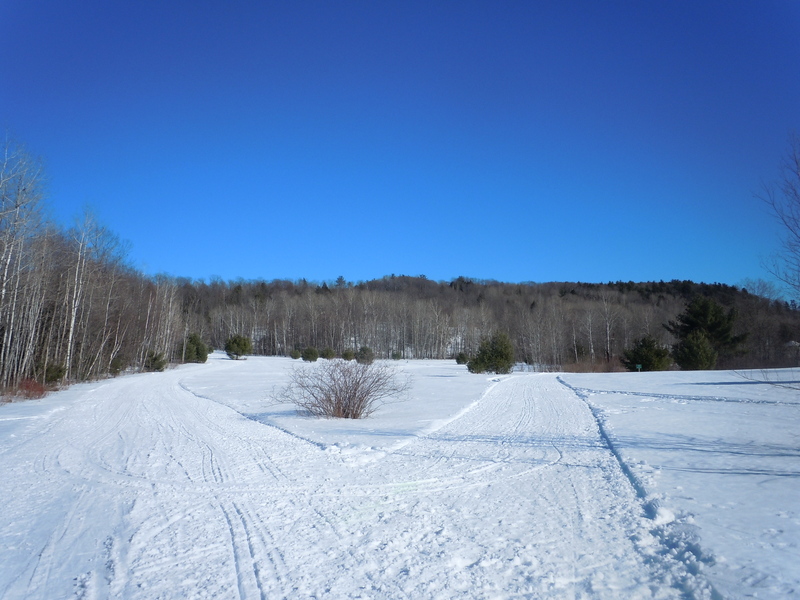 We enjoyed a beautiful day and great ski conditions, even with a few un-groomed trails. After I got home from skiing, I completed three sets of strength and balance exercises. Fresh snow on UMaine’s ski trails. The un-groomed field on a sunny day. Wednesday: The workout calls for 40 minutes of stairs. Since I workout from home, this means walking up and down my stairs. This was quite boring, so I climbed for 10 minute intervals with a set of strength training in between. During the intervals, I would start out walking one stair at a time and then moved up to intervals of two and three stairs. I was very tired at the end of this workout! Saturday: I visited my AT hiking partner over the weekend, and today we went for a three mile hilly run. Another beautiful day and I felt strong! 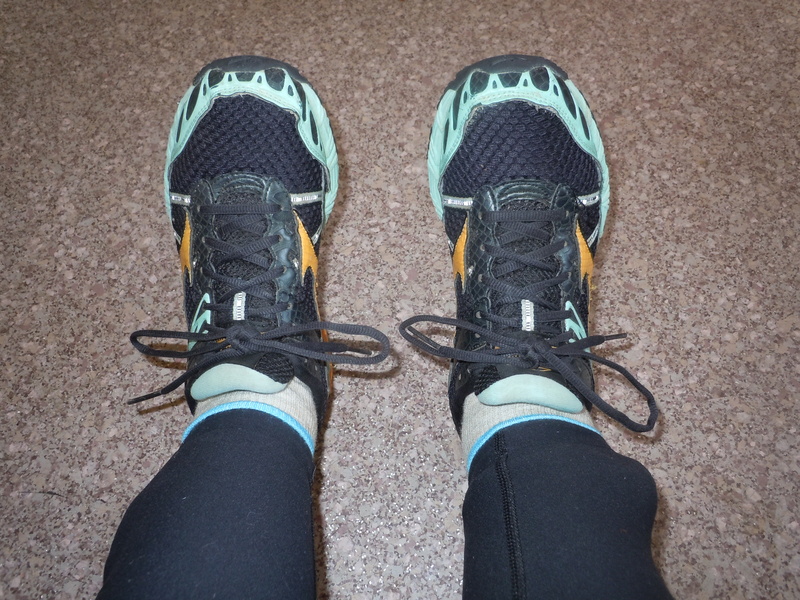 Sunday: Today, my knee injury flared up as I set out for another three mile run. I had to stop after a mile and a half in order to prevent myself from another injury. I walked a mile and a half back home. This week of training was slightly disappointing for me. I really wanted to train harder than I did, but was held back. I am really looking to take it to the next level for week three. That means more outdoor adventures. Stay tuned for details! A sunny day on Perch Pond. I dive head first into my training as we hit the seven week mark. This burst in training is partially to do with the date but very much so to do with the weather. Finally we see some snow! As an outdoor recreationist, I am increasingly having difficulty exercising indoors. I find staring at a TV much less stimulating than being in the woods. Music helps make gym type exercise more entertaining, but, let’s be honest, music does that in most situations! Gym rant aside, Maine finally got hit with some snow that has worked its way up the AT, intensifying as it hit New England. Mother Nature seems to be consistent with this. 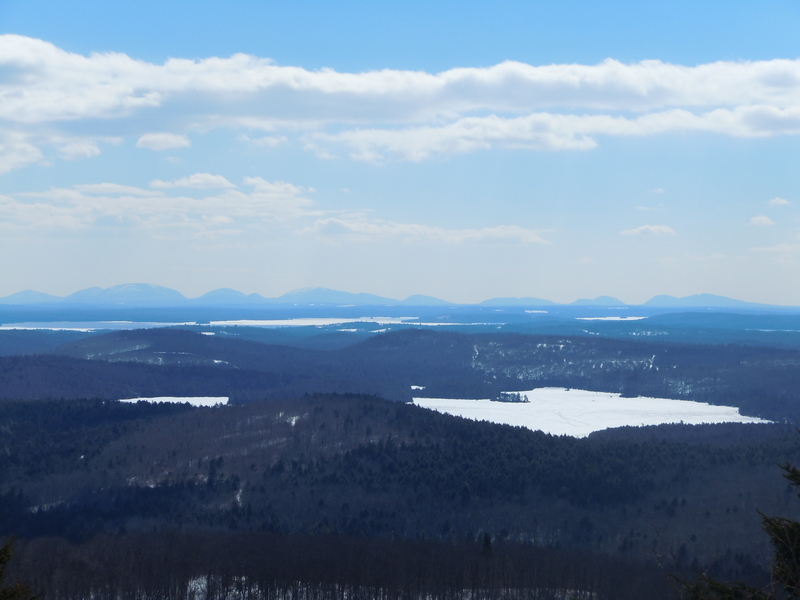 The weather in Maine can be as rugged as its mountains. But alas, the change in weather has sparked a push for training. These were the recommended exercises from Alami’s page. This is the base of what I’ll be calling “Strength Training” in this and future posts. Wednesday: The plan calls for 20 minutes of cardio. 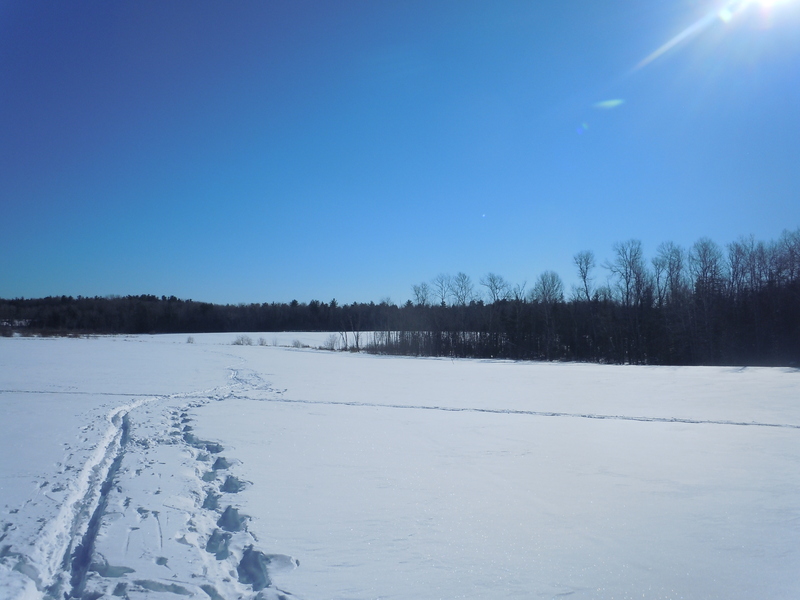 To do this I decided to go snowshoeing at the Perch Pond Recreational Trails in Old Town. I ended up snow showing for two hours and was able to see the majestic flight of a bald eagle who was hunting from a tall pine beside the pond! 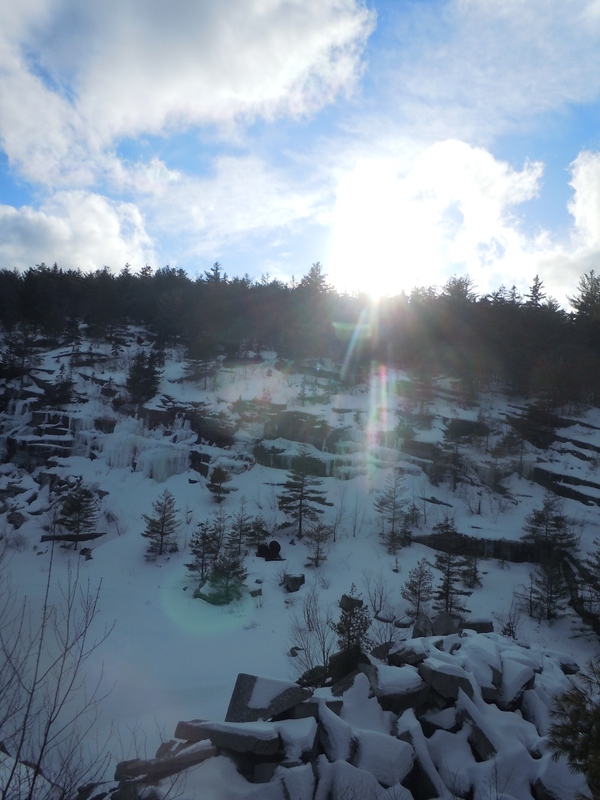 The entire walk was beautiful, as the freshly fallen snow glittered and sparkled in the sun. 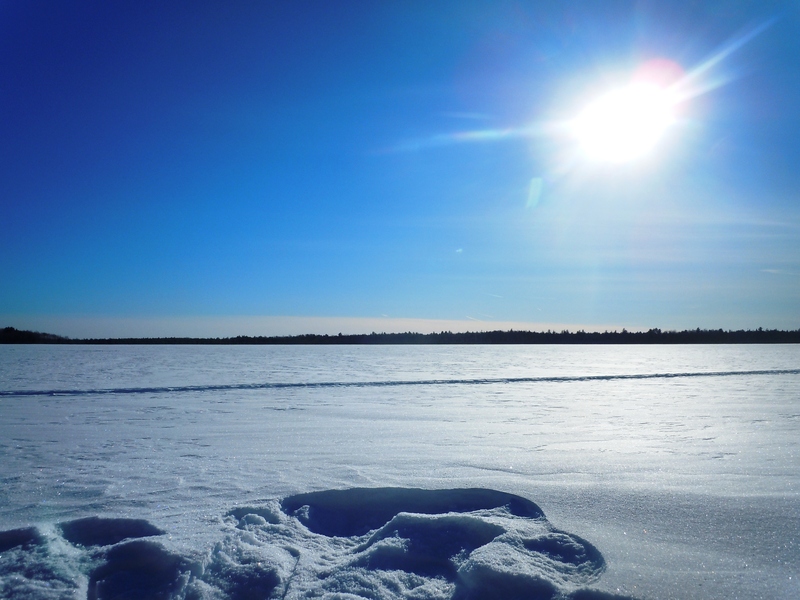 Who needs diamonds when you’ve got white snow and a sunny day?! 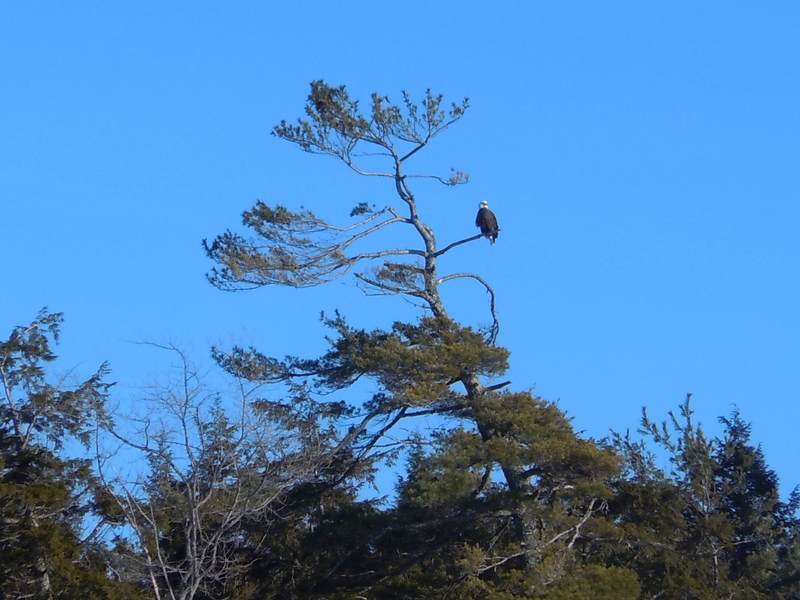 Close-up of Bald Eagle on Perch Pond. A picture of myself on Perch Pond with a pouch full of gear! Thursday: This was a very successful day of training. 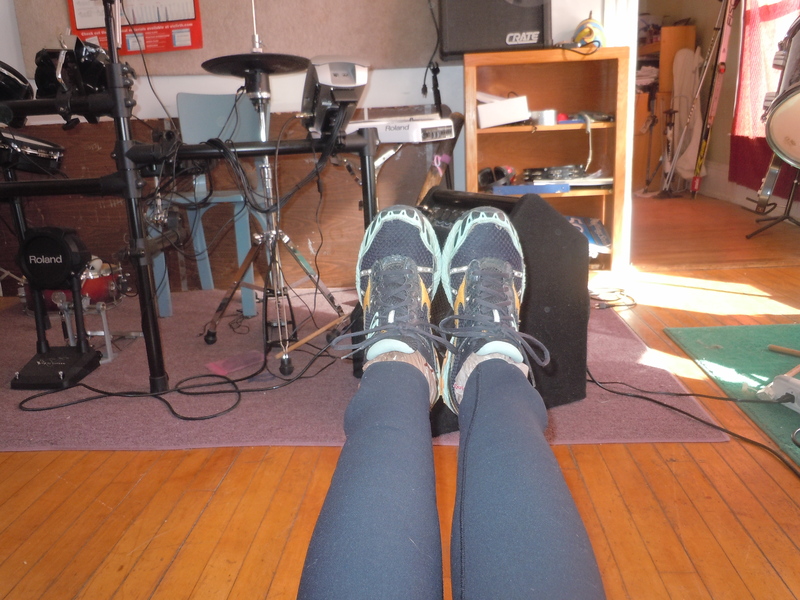 To start, I did dynamic stretches for about ten minutes. I did 20 minutes of strength, with a few new exercises. I then completed 20 minutes of stairs doing intervals of walking, running, two and three stairs at a time, and sprinting. I then did 20 more minutes of strength. After exercising indoors for an hour, I’d had enough! I geared up with my two main training buddies and headed for the Bangor Forest. It was night time during a snow storm, so we were completely alone out there. 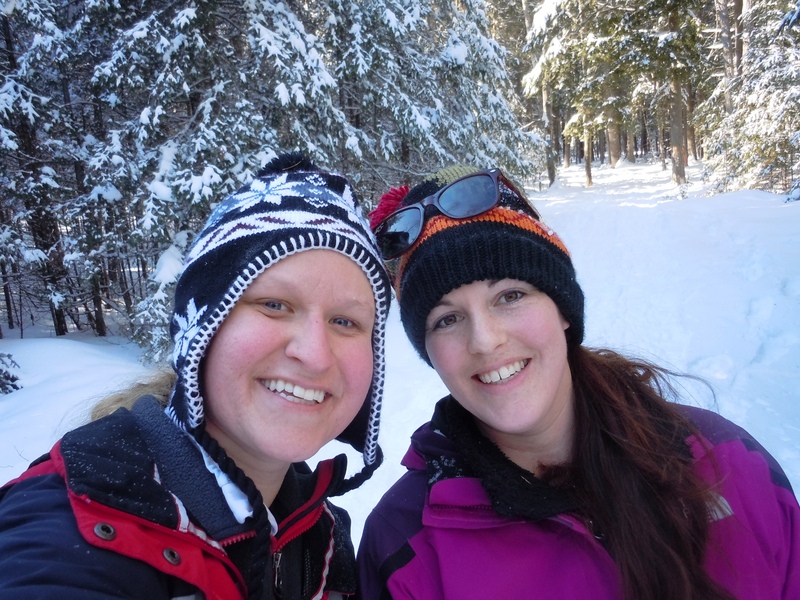 We walked for four and a half hours on our snow shoes! When we got back to the car, it was stuck in the snow and we had to push our way out of there. By the time we got home, sometime between 1 and 2 AM, we crashed hard! What a fun and exhausting night adventure. 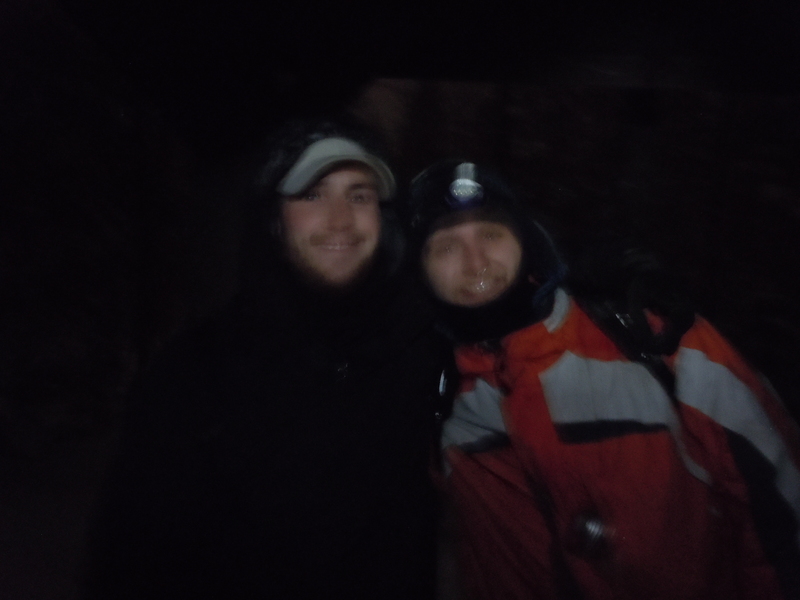 Sage (left) and Krystian (right) as we embark on our late-night snowshoe adventure. 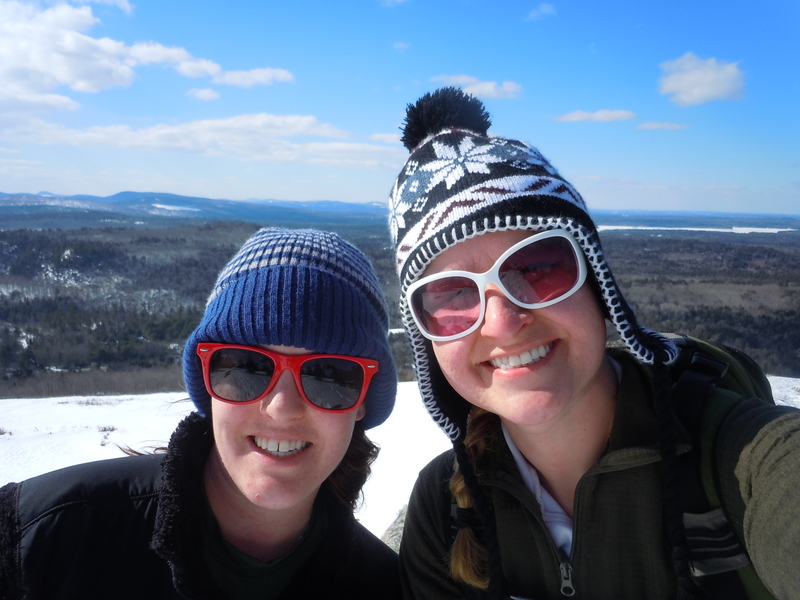 Saturday: Today I headed to Acadia National Park with a training buddy for some more snowshoeing. 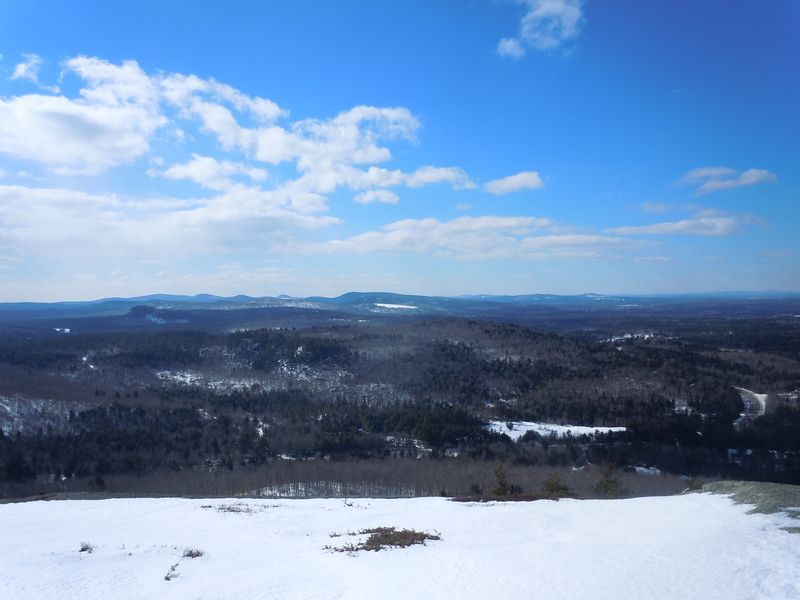 Since the park is on an island off the coast of Maine, most of the snow had blown away. 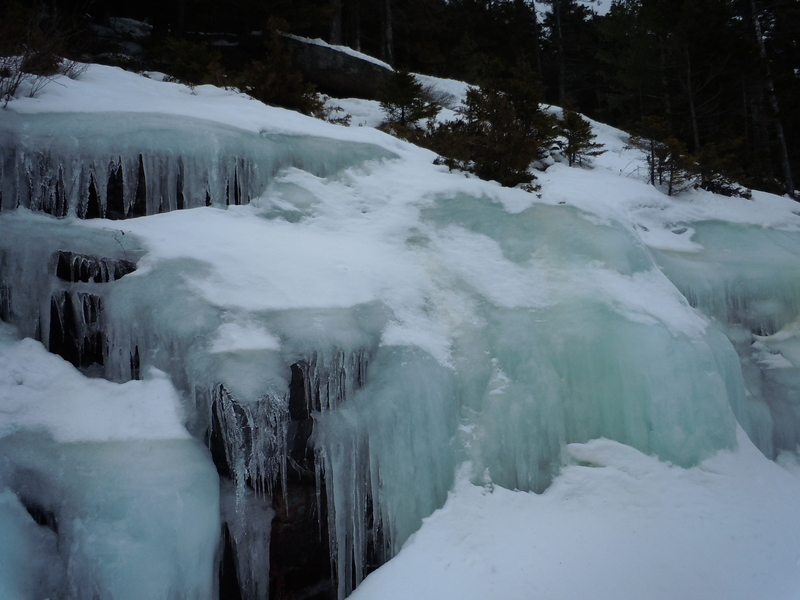 This created icy conditions and very little snow pack. For safety reasons, we decided to hike along the carriage roads. We hiked for two and a half hours and got some great view of the island’s mountains and the ocean beyond! I would definitely like to come back here to train and hike some of the hiking trails. Blue ice along carriage trail. So that was it for week one. Stay tuned for week two! A special thanks to my training buddies for making my training fun and exciting! It’s going to take us a lot longer than 5 hours to get back home! 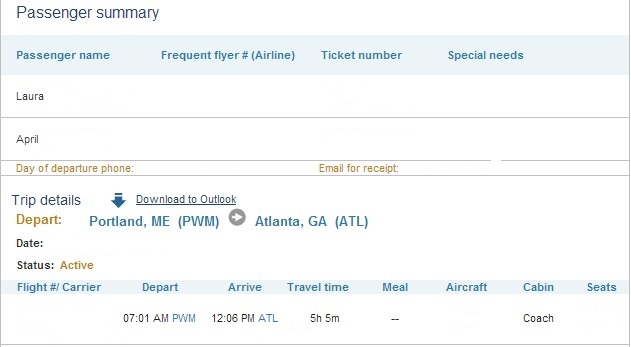 We’ve bought the plane tickets and there is no turning back now! 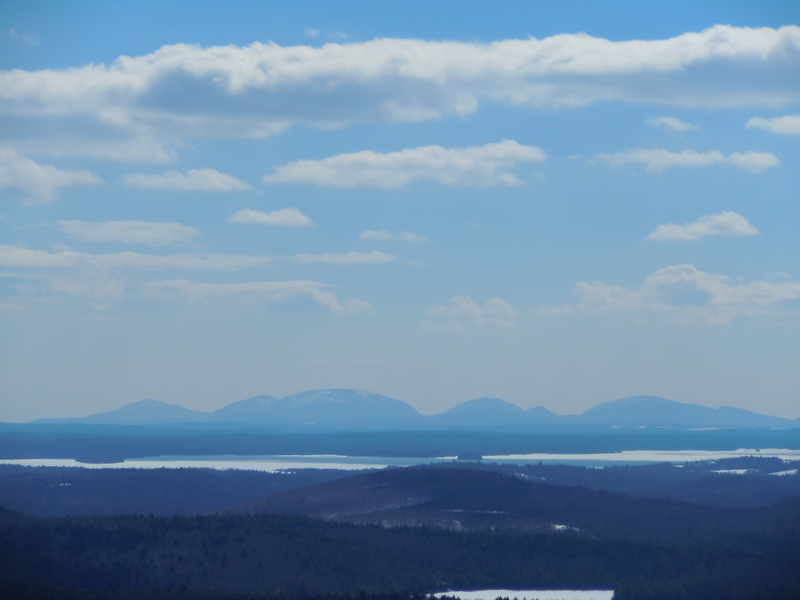 We will be leaving in early April and setting the pace to reach Katahdin by mid-September. Only time will tell if that estimate is accurate! Just three months left to plan and train… guess it’s time to get moving! Training ideas coming soon.